WASHINGTON, Feb. 26, 2002 -- Roto Zip Tool Corporation is voluntarily recalling about 1.9 million handheld saws. The handles on these saws can separate from the body, causing the operator to be cut. he recall is being conducted in cooperation with the U.S. Consumer Product Safety Commission (CPSC). CPSC and Roto Zip Tool Corp. have received 360 reports of loose or separating handles on the saws. As a result, there have been 19 reports of injuries to consumers, including some cuts requiring stitches. Home, hardware and department stores, and infomercials sold these saws nationwide from December 1999 through January 2002 for between $50 and $190. Consumers should remove the handle from their recalled saw if there is a loose fit between the tool handle and the tool body, and contact Roto Zip Tool Corp. to receive a free replacement handle. For more information, contact the Roto Zip Tool Corp. toll-free at (800) 920-1467 between 7 a.m. and 7 p.m. CT any day of the week, or visit the firm's web site at www.Roto Zip.com. WASHINGTON, Feb. 26. 2002 -- In cooperation with the U.S. Consumer Product Safety Commission (CPSC), Ingersoll-Rand Company, of Woodcliff Lake, N.J., is voluntarily recalling about 458,000 portable air compressors sold between 1983 and 1991. Internal corrosion to the inner wall of the air receiver tank can cause the air tank to unexpectedly rupture allowing pressurized air to suddenly and forcefully escape, posing risk of injury to consumers. Consumers should stop using the air compressors immediately and contact Ingersoll-Rand for instructions on returning the compressor, freight paid. Consumers will have the option of being sent a check for $100.00 or receiving a $200.00 credit towards the purchase of a new DD2T2 air compressor. For more information, consumers can contact Ingersoll-Rand at (877) 552-2952 between 8 a.m. and 5 p.m. ET Monday through Friday or visit the firm's web site at www.air.ingersoll- rand.com. 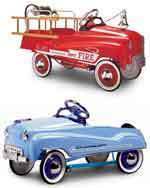 WASHINGTON, Feb. 20, 2002 --Alpha International Inc., also known as Gearbox Pedal Car Company, is voluntarily recalling about 75,000 pedal cars because the paint coating on some of these pedal cars contains high lead levels. The recall is being conducted in cooperation with the U.S. Consumer Product Safety Commission (CPSC). CPSC standards ban toys and other children's products containing high levels of lead. Young children could ingest the lead from the car's paint coating, presenting a lead poisoning hazard. Coca-Cola," "Raley's Keebler," and "Red Lion." WASHINGTON, Feb. 20, 2002 -- Random House is voluntarily recalling about 39,000 copies of Monsters In The Closet children's board books. The snap that secures the book could detach, posing a choking hazard to young children. The recall is being conducted in cooperation with the U.S. Consumer Product Safety Commission (CPSC). CPSC and Random House have not received any reports of injuries involving this book. This recall is being conducted to prevent the possibility of injuries. The board books are constructed of heavy cardboard with Monsters Inc. cartoon characters on each page. The title "MONSTERS IN THE CLOSET" is printed with orange letters highlighted in yellow on the front cover of the books. The books have a hole at the top of the back cover to allow them to hang on a door knob. The books have been printed in English and Spanish languages. "Made in China" is printed on the back of the book. Book, specialty stores and online retailers sold these books nationwide from October 2001 through January 2002 for about $8. Consumers should cut off the snap from these books immediately and mail the snap to: Tri-State, c/o Marie Corsello, 325 Rabro Drive, Hauppauge, NY 11788 to receive a free replacement book valued at about $9. For additional information, contact Random House at (800) 493-0009 \ between 9 a.m and 5 p.m.ET Monday through Friday, or visit the firm's website at www.randomhouse.com. WASHINGTON, Feb. 7, 2002 -- In cooperation with the U.S. Consumer Product Safety Commission (CPSC), Applica Consumer Products Inc. is voluntarily recalling about 2.1 million "VersaToast" wide-slot toasters. 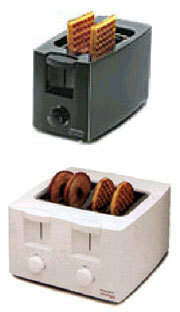 Applica made and sold these toasters under the Black & Decker brand. The heating element in the toasters can continue to operate after use, posing a fire hazard. The recall includes both two-slice and four-slice Black & Decker brand VersaToast wide-slot toasters. "Black & Decker," "VersaToast" and "WIDE SLOT" are written on the side of the toaster near the cooking controls. The toasters have either white or black plastic enclosures. They have model number T1200, T1250, T1400 or T1450 written on the bottom of the toaster. Discount department stores, including Wal-Mart, Service Merchandise, Kohl's Department Stores and Bradlees, sold the toasters nationwide from June 1999 through January 2002. The two-slice toasters sold for between $10 and $20. The four-slice toasters sold for between $18 and $30. Consumers should unplug and stop using these recalled toasters immediately. For more information on receiving a refund, consumers should call Applica Consumer Products Inc. toll-free at (866) 264-9230 anytime, or go to the firm's web site at www.householdproductsinc.com.